At a ceremony on Tuesday, OMRF dedicated its Masonic Charity Foundation of Oklahoma Aging and Alzheimer’s Research Laboratory. Masonic Charity Foundation of Oklahoma Board President Elwood Isaacs, Executive Director John Logan, and other Masonic representatives attended a luncheon and dedication ceremony at the foundation. A $1 million gift to OMRF in 2009 initially established a Masonic Charity Foundation Laboratory, which was home to Alzheimer’s researcher Jordan Tang, Ph.D. With Tang’s recent retirement, OMRF officials relocated the Masonic name to a lab in its Aging and Metabolism Research Program. Since closing its Oklahoma Masonic Home in Guthrie in 2000, the Masonic Charity Foundation has continued to find new ways to aid Oklahoma’s aging community with their support of research at OMRF serving as an example of one of their many fruitful endeavors. 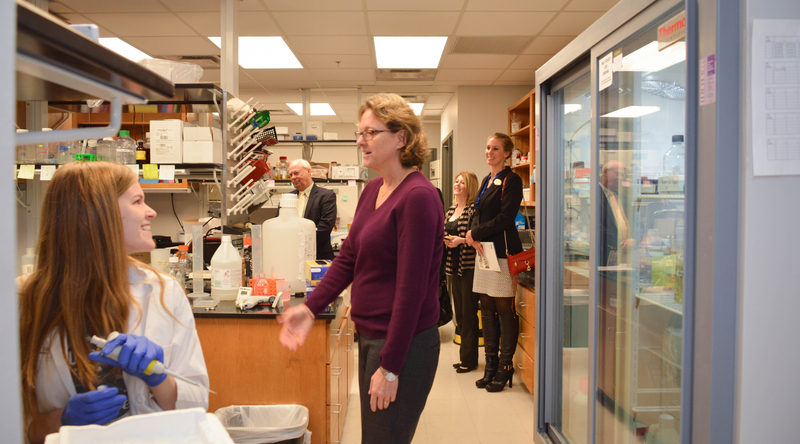 The new Masonic Fraternity laboratory will be home to Holly Van Remmen, Ph.D., chair of OMRF’s Aging and Metabolism Research Program. Van Remmen’s research focuses on diseases of aging, with an emphasis on loss of muscle as people grow older. In 2016, Van Remmen received the prestigious Denham Harman Award from the American Aging Association for her contributions to aging research. She was also critical in the establishment of Oklahoma’s first Nathan Shock Center of Excellence in Basic Biology of Aging, teaming OMRF with researchers at the University of Oklahoma Health Sciences Center and the Veterans Affairs Medical Center to investigate what predisposes older people to diseases like Alzheimer’s. It is one of just six Shock Centers in the United States.